We have gathered continuous feedback from the learning community regarding user interface and are excited to introduce learninghub.sap.com as our new homepage for navigating SAP Learning Hub. You will be able to access all of the functions you would expect to find in the old home space in a simplified and more dynamic layout. 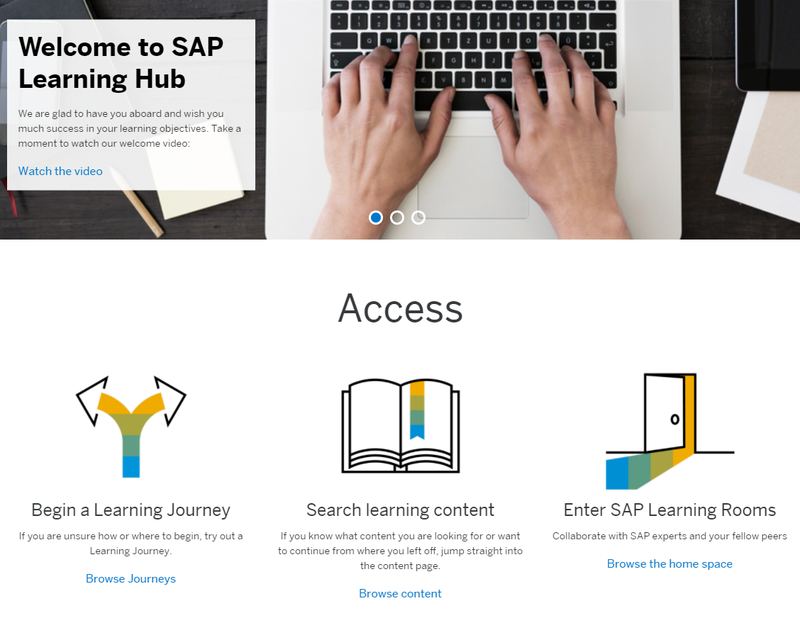 Click Login on the top right corner to gain access to your subscription and begin exploring the new SAP Learning Hub access page. At the middle of the page you will find a rolling message carousel displaying notifications relevant to users of varying roles. Most importantly, direct access to Learning Journeys, your learning content page and the learning room home space is right below the carousel, so you can jump directly into the learning activity that you would like to undertake. All other additional information and resources can be found in a categorized menu towards the bottom of the page. For the time being, the old home space will remain intact as-is until our transition to the new access page is complete. Please note that public cloud versions of SAP Learning Hub users are only supported currently, but we are working to add support for private cloud versions (those of you with company themed UI) soon. Additional features like a profile page which displays your account information, a help center and edition specific page content is also planned. So stay tuned. Give it a try and let us know what you think in the welcome room! Would you like to get Full SAP Tutorials Access?